From back in my old flight instruction days. There is a tradition in flying. When someone go out on their first solo flight, makes three landings, and comes back with the airplane intact, there is a ceremony as they step out of the airplane. We [the instructors], cut their shirt tail off [some times the whole back of the shirt]. Than we take a picture of it and hang the shirt tail and the picture on the wall inside the student room / class room as a trophy. Later, many students often take the picture and the shirt tail home, frame it and display it in their home as a momento of their first SOLO FLIGHT. 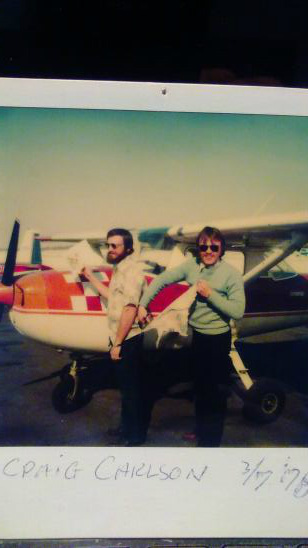 This picture show one of our instructors, Odd Bjerkenaas [an airline captain now] cutting the shirt tail off one of the students, in front of one of our trainer airplanes - a Cessna 150 Aerobat.